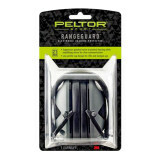 The Peltor Sport RangeGuard Electronic Hearing Protector is quite a high tech piece of safety equipment. It blots out the reports of gunshots marvelously, so when you’re old and gray you won’t have to annoy your neighbors by turning the television volume up to 100 just so you can hear what the people on your shows are saying. (You may still wind up doing this anyway, of course.) In spite of its stellar ability to cancel out harmful noises, the RangeGuard is able to pick up and amplify the welcome voices of those speaking to you. This helps to preserve the inherently social aspect of shooting, and won’t leave your friends yelling at you while you’re trying to deal with clips and mags. 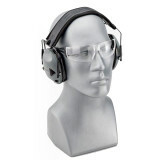 These earmuffs have a low profile cup design which enables you to naturally wield a rifle or shotgun while wearing them. They’re a comfortable piece of equipment, with a padded headband that you may adjust however you see fit. They additionally feature a 3.5mm audio jack so you can use a walkie talkie or listen to your favorite tunes while you’re shooting (we recommend Wagner’s Ride Of The Valkyries), and they will automatically turn off after four hours of use so as to not let their two AAA batteries drain out. 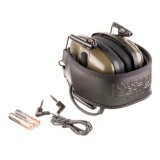 Howard Leight's Impact Sport electronic earmuffs are a huge improvement over conventional designs in multiple ways: their slim form factor helps reduce the issues many shooters have clearing the stock of long guns against the cups of their hearing protection devices. In-ear earplugs can be worn under these muffs for additional protection if needed. 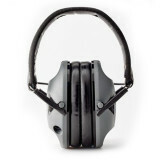 The active noise reduction of these earmuffs promises a noise reduction rating of 22, keeping the sounds of your firearm and those of nearby shooters to a safe level. At the same time, the device actually amplifies certain sounds such as human voices--a huge social and safety benefit, as you'll finally be able to hear your shooting buddies and the range officer over muzzle blasts. 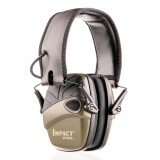 For those who shoot alone, these earmuffs include an audio jack that can connect to your phone or MP3 player. This headset is powered by two AAA batteries, with the first set included in the package. The battery compartment is external and easy to reach, though you won't need to worry about accidentally draining the batteries quickly thanks to the automatic shutoff feature. I purchased one of these almost 8 yrs ago now and was so impressed as soon as I used it, I bought a 2nd one. I'm not sure why one reviewer had trouble with the muffs sealing as they are made from very soft and pliable plastic type covers over foam and they seal excellently. In the 8 yrs I've had mine, I have yet to change the batteries and I keep an eye out to make sure the batts don't leak, but if you purchase good batteries, they shouldn't leak. I love the way they fold up and fit in my 50 cal ammo box that I take to the range with target stickers, glasses, muffs, and tools, etc. for the weapons I shoot. I wouldn't hesitate one bit to buy another set of these if the need arose, as I say, they are an excellent choice. I have two pairs of these. I like the way they fold up and they seal tight. 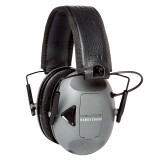 There is ear protection with higher NRRs but these are fine for a handgun, shotgun, and most rifle shooting. When the batteries start to get low they develop a low hum but they still work. These are by far the most popular ears seen on our range and at Widener's $39.95 sale price they are a bargain. Comfortable and allows for a solid cheek weld but not quiet enough for me, esp when shooting w magnums or muzzle brakes nearby. You should use these w soft earplugs. These fold up compactly but the problem is the way they fold makes the material take a set which pulls the ear cups from your head when wearing them allowing sound to leak through. My ears were ringing after a short range session. I've left them unfolded to hopefully allow the material to relax and will try again but I don't have much hope for these. The microphone did pick up sounds rather well and normal conversation was easy.